We were a group of 9 adults and 1 child looking to relax and enjoy some down time and Sisanya proved to be the perfect place. The house is very spacious and modern, with an excellent outdoor BBQ and pool area. The outdoor table was perfect for enjoying a few drinks and playing card / board games. The bedrooms were noise cancelling and allowed my 10 month old son to sleep uninterrupted from the noise in the main living areas. 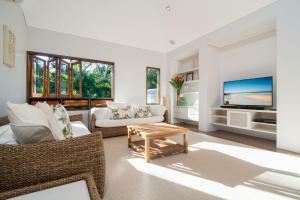 The house is located a few minute walk to the beach and a short drive from the main strip and the closest golf course. Martin the house owner was great, we had contact a few times in the lead up to our stay and each time he was very helpful and quick to respond. Would highly recommend Sisanya and would definitely stay here again. 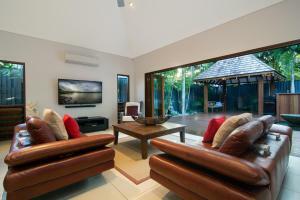 This is a gorgeous villa, with everything you could possibly need and an excellent location near Port Douglas. I'd highly recommend it. We'll definitely be returning. Thank you. Absolutely stunning house! Enormous bedrooms, fully equipped house that had everything we needed for a week long family holiday (6 adults). The house was elegant and spacious with a lovely toddler pool. It really felt like a luxurious week away. 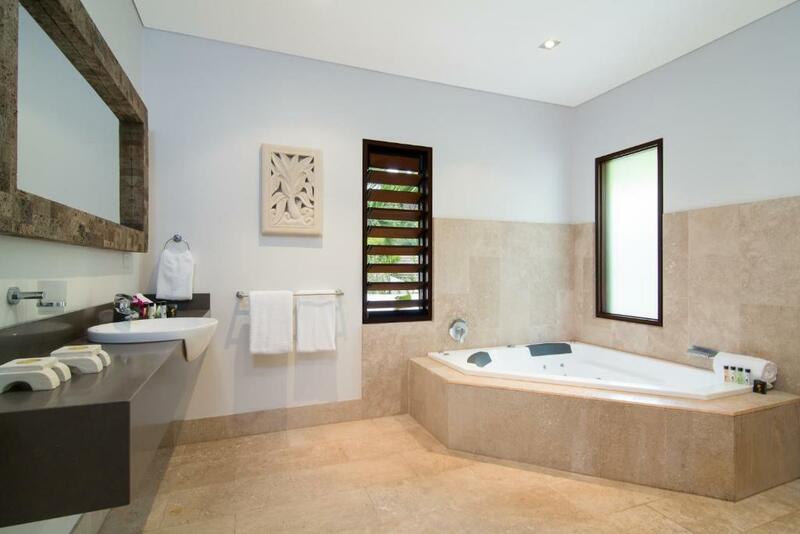 The bedrooms were large, the beds really comfortable and beautiful bathrooms. There were large outside eating and reclining areas with plenty of shade and candles galore. Martin was a very helpful host. The layout and general feel and look for the house was amazing. The water features were beautiful and location to beach was excellent. Lock in a great price for Sisanya Home – rated 9.2 by recent guests! One of our top picks in Port Douglas.Sisanya Home is located in Port Douglas, 3.1 miles from Marina Mirage, and has a terrace, garden, and free WiFi. This vacation home is 3.1 miles from Crystalbrook Superyacht Marina and a 19-minute walk from Rainforest Habitat Wildlife Sanctuary. 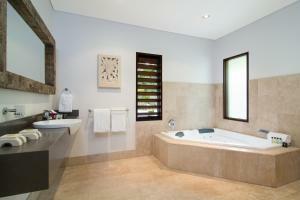 This air-conditioned vacation home comes with 5 bedrooms and a bathroom with a bath, a shower and free toiletries.. The property is equipped with a kitchen with a dishwasher and an oven. The vacation home has an outdoor pool. A grill can be found at the property, along with a shared lounge. Macrossan Street is 2.9 miles from Sisanya Home. 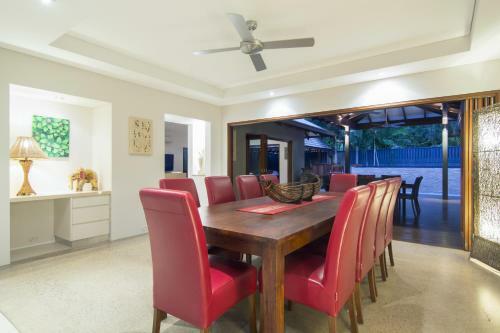 The nearest airport is Cairns Airport, 39 miles from the property. When would you like to stay at Sisanya Home? 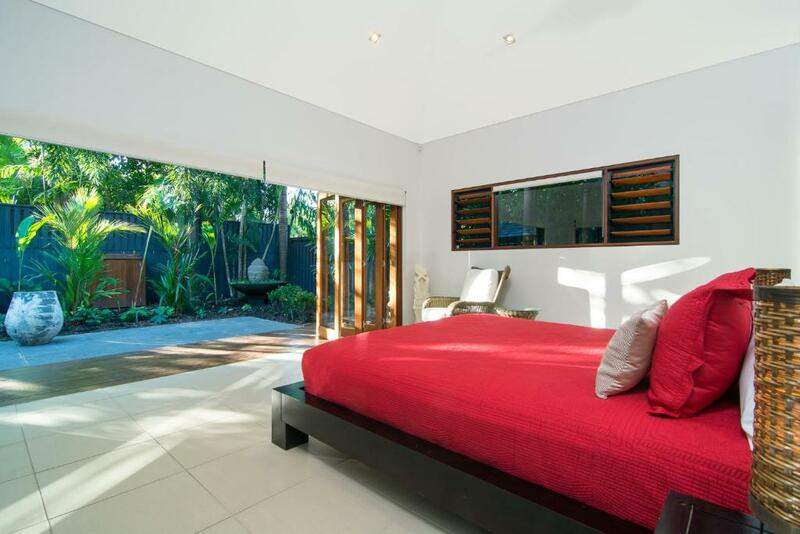 This house features a kitchen, flat-screen TV and a bathroom with a bath and a shower. 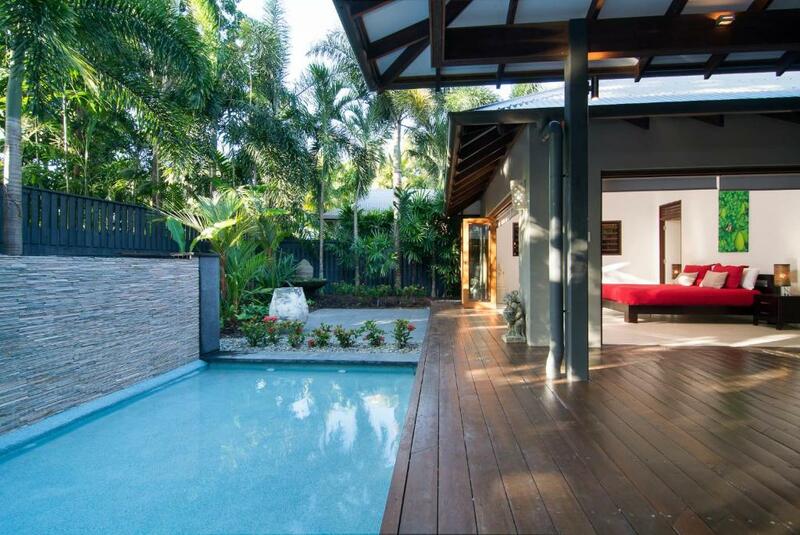 Sisanya is located in an exclusive and secure gated estate in Port Douglas. The house is less than a 5 minute walk to Four Mile beach and a 5 minute drive to the town centre Macrossan Street. 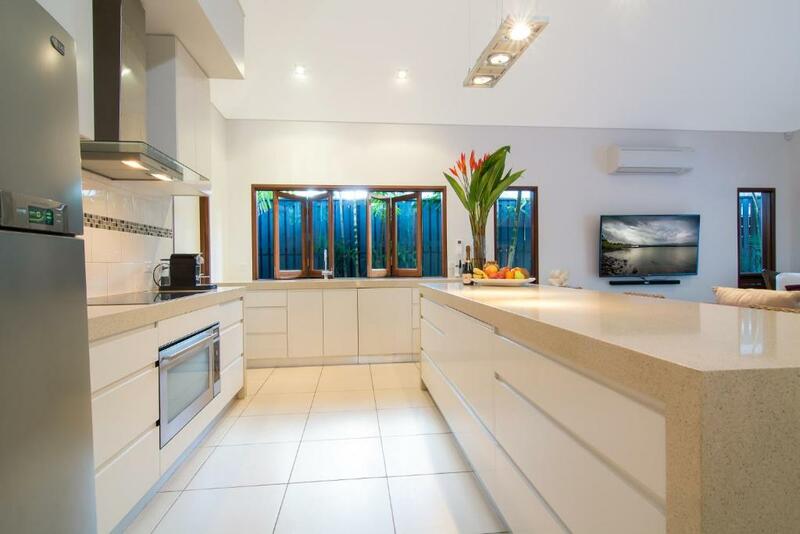 This custom built 5 bedroom, 4 bathroom home, has been constructed with the entertainer in mind. It caters for couples, families, and also can accommodate two families while still allowing separate living spaces! Immediately upon entering the home one is met with the feeling of comfort, peace and tranquility. Two of the three large bedrooms downstairs are fitted with spacious ensuites graced with superb fittings equivalent to a 5 star hotel. Further Sisanya features a generous formal dining area, perfect for accommodating both large and small groups of family and friends. Just past the dining area, the spacious kitchen with European appliances and an expansive caesarstone benchtop has been designed with the home chef in mind. Seamlessly, the flow from kitchen to the main indoor family room, with extra large LCD TV, complete with Cable & Free to Air. Furthermore, the entire area has the ability to be opened to allow the transition between indoor & outdoor. Married with 3 children, live in Sydney Australia. I like to travel and see interesting places, taste all of the different foods on offer, when I'm not at work I love to cook, especially Indian cuisine, spicier the better! Port Douglas Australia is just an hour’s drive north from Cairns via a spectacular coastal road that is surrounded by forest and the Coral Sea. The climate is seductive. Balmy days dissolve into tropical evenings with velvet starry skies. It is the only place on Earth where two World Heritage listed jewels exist; the Great Barrier Reef and the rainforest of Daintree and Cape Tribulation. Refresh, restore and revitalise, in the aquamarine reef waters of the Coral Sea, the crystal creeks of Mossman Gorge, and the palm fringed golden sands of Port Douglas’ Four Mile Beach. Discover the breathtaking northern tropics of Australia through pristine Daintree Rainforest walks and safaris, diving and snorkelling the reef and sailing the waterways. Be inspired by the amazing array of nature and wildlife and glorious simplicity. The tropics are a feast for the senses; the sights, sounds and tastes; you will never want to leave! Getting Around: Sisanya is conveniently located within walking distance of four mile beach, great local shops and fantastic eateries. Furthermore you can hire push bikes to ride on the beach or get into town faster. There are shuttle buses and taxis if required. House Rules Sisanya Home takes special requests – add in the next step! A AUD1500 damage deposit is required 14 days before arrival (about USD1072.72). This deposit will be fully refunded 7 days after check-out, as long as there isn't any damage to the property. Sisanya Home accepts these cards and reserves the right to temporarily hold an amount prior to arrival. Please note you will be contacted by property to arrange payment via bank transfer. A damage deposit of AUD 1500 is required. The host charges this 14 days before arrival. That's about 1072.72USD. This will be collected by credit card. You should be reimbursed within 7 days of check-out. Your deposit will be refunded in full by credit card, subject to an inspection of the property. Please inform Sisanya Home of your expected arrival time in advance. You can use the Special Requests box when booking, or contact the property directly using the contact details in your confirmation. The main pool was unheated and shaded by foliage all day so a little cool to swim in in August. But the children didn't seem to mind.